See How Going Green Puts More Green in Your Pockets: 3 Great Examples! Everyone knows that going green is good for the environment. To go green means to consciously eliminate habits that cause harm to the environment and to adjust your behavior and lifestyle to have less of an impact on the earth. You might think that going green can be costly, but the opposite is true. 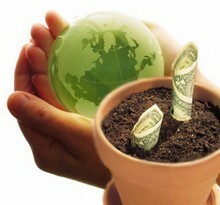 While there may be a little upfront expenditure involved, in the end, going green can save you a good bit of money! Green cars — like the Toyota Prius or the Honda Civic Hybrid — can be very expensive. Until the cost of gasoline went through the roof, these cars were more of a good idea than a necessity. If you’re thinking about trading in your gas-guzzler for a hybrid, you may want to wait until your current car is on its last leg. Compact Florescent Lightbulbs (CFLs) cost 10 times more than regular light bulbs. To change all of the light bulbs in a typical home can cost upwards of $100. Rain barrels to conserve water cost at least $150 each, but you can build your own for under $10. Your hybrid car will cut your gasoline bill by more than 50%. However, you will save a lot more than gas money! Compact Fluorescent Lightbulbs may have a higher upfront cost, but you only need to purchase 1 CFL bulb for every 10 regular light bulbs. This automatically levels the playing ground. In addition, you will save $30 more on electricity cost for each CFL you buy. Before you make the switch, check out this CFL buying guide. These are just a few of the things you can do to go green while saving money. Worldwatch Institute also has a list of 10 Ways to Go Green And Save Green. In addition to offering helpful ideas for conserving energy, water, and gasoline, they say you should also change your diet to eat less meat and avoid plastic bottles and other plastic containers. There’s no doubt about it, going green is cool these days. It’s clear that green is the new black. A person that may have ridiculed you as a tree hugger just 10 years ago is very likely hanging on the tree next to yours right now.